In the run-up to the 2015 Scottish Labour Conference, when the refugee crisis that is still affecting millions today first came to prominence, my home CLP, Midlothian South, Tweeddale and Lauderdale, proposed an emergency motion to respond. That motion was selected to be debated on the Conference floor and was passed with unanimous support. During the debate, I addressed Conference, urging the floor to remember our proud history of supporting refugees and making clear my firm belief that we had a duty to do more. The transcript of my speech is below. When David Cameron announced his plan to accept refugees into the United Kingdom, his headline figure was 20,000 refugees. 20,000. Barely enough to fill one fifth of Wembley Stadium. Two thirds of 1% of the total number of refugees from Syria. Less than 31 refugees per constituency. These are not figures to be proud of. Britain has a proud history of welcoming refugees. From the tens of thousands of Asians escaping persecution in Idi Amin’s Uganda, to the Jews who fled from Hitler’s Germany, the United Kingdom has led the world in welcoming those who have nowhere else to go. Because, just as with refugees from Syria today, they had nowhere else to go. Those who flee Syria do not do so from choice. They are not, as some suggest, economic migrants who come to Britain based upon a calculated decision to seek a higher standard of living. They flee Syria, leaving behind everything they know, because doing so is their only chance of survival. This nation has a duty to do more. When our friends and neighbours across Europe are taking as many as half a million or more refugees, we cannot simply sit here today content with 20,000. There is a moral imperative upon us to do more. That starts with working with our friends and neighbours across Europe to secure a fair, equitable and moral distribution of refugees throughout the continent. Conference, it cannot be said that refugees, or indeed immigration in any of its forms, have negatively affected the UK. In a time when our population is aging, an influx of the young is essential in ensuring the continued success and prosperity of the economy, and the stability of our welfare system. Nor can it be said that refugees will harm community cohesion: examples throughout our history suggest otherwise, and I firmly believe that modern Britain is more tolerant than ever before in our history. Conference, we are all human. Each and every one of us, be we Scots, Syrians, refugees or British citizens, share within us those essential things that make us human: compassion, kindness and solidarity. It’s time the United Kingdom stood up and said this. It’s down to us to make that happen. Conference, I urge you to support this motion. That Conference rejects the Government’s proposed imposition of a restriction on the number of asylum seekers received in the U.K. to 20,000 during this Parliament as a denial of their rights of refuge from violence, oppression and poverty and an abuse of the traditional right of our citizens and humanitarian organisatons to provide asylum to those in need; calls on the National Executive to demand that the UK join in and support the EU Agenda Programme on Migration; and for that purpose undertakes, through the Labour Party Task Force on Refugees, the research and preparation needed for a planned programme of refuge, welfare and opportunity to reside and contribute to Scottish society to all asylum seekers, whether in camps around Syria or in transit in Europe or in Northern Africa. Scottish Labour is at a crossroads, and the choice before us is a stark one: do we embrace a modern, boldly socialist vision that can and will lead us back to power and change Scotland for the better, or drift onto the vague road to electoral irrelevance, clinging to the past instead of moving with the times? It may sound dramatic, but these are the issues which face us today, and the time for a decision is now. There is no doubt in my mind which path we must follow. Throughout history, it has always been the young who are at the forefront of change and progress. It has always been the young who push boundaries, challenge established wisdom, and ultimately make change happen. The Scottish Labour Party today is in a rut, and only by ensuring the voice of young Labour members across Scotland are heard can we hope to escape this. The importance of the youth positions on the SEC are therefore of vital importance. Today, young Labour members are overwhelmingly of the Left. Across Scotland, and indeed the UK, young people are being mobilised by the politics of Jeremy Corbyn, the politics of equality, fairness and socialism. The youth of today have grown up in the crisis of capitalism that has shaken the very foundation of the economic system that for so long was seen as unassailable and so today’s youth does not see politics anywhere near the same as those who grew up twenty or thirty years ago see it. As has been proven time and time again in recent years, there has been a fundamental shift in the way politics works. Scottish Labour must catch up, and young Labour members must be at the heart of that. The significance of these youth SEC elections is therefore clear. 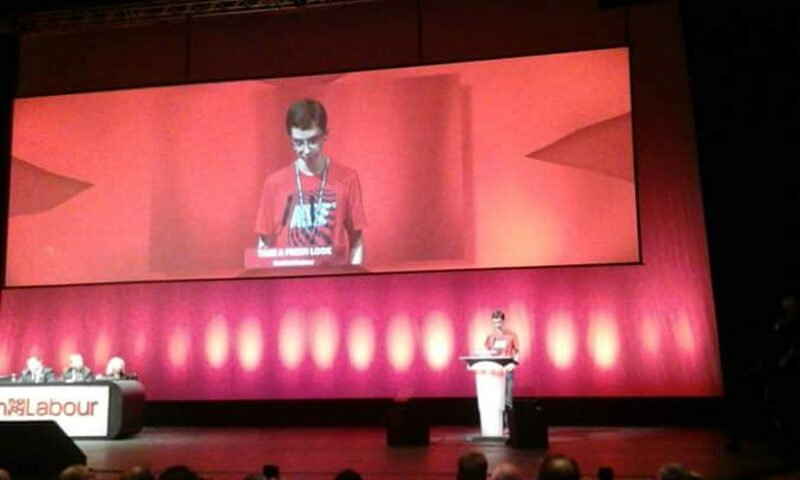 It is essential that the elected youth representatives be able to clearly and passionately articulate the views of the majority of young members on the direction that Scottish Labour must take. It is vital that they are committed to the boldly socialist ideals that must be at the heart of Labour’s future success. And it is crucial that they have the determination and grit required to fight for the bold, socialist Labour government we need to change Scotland for the better. I believe I fulfil those values. I joined Scottish Labour on my 14th birthday. Since then I’ve been fighting to advance the socialist Labour values we all believe in. From speaking at Conference in defence of refugee rights, to standing up for the interests of young members in my constituency, to campaigning for Labour candidates both in my constituency and across Scotland, I have proven time and again my commitment to our socialist values. I have experienced first-hand the fundamental economic inequalities which are at the heart of the growing gig economy. I worked on a zero-hour contract, with irregular, short-notice hours making planning a proper work-life balance all but impossible, and the painfully low wages that go along with such work. I know the vital importance of trade unions in fighting for the rights of young people against the bosses who seek to take advantage of our perceived inability to challenge them and I completely believe in the necessity of the whole Labour movement, party and trade unions both, working in tandem in order to transform the status quo to make work pay for everyone. Ultimately, I want to take my commitment to and involvement in the Labour Party to the next level. It’s time for a boldly socialist Scottish Labour Party to stand up and make our voices heard. I want to represent all young members across Scotland on the SEC, to put our shared values into action so we can build Scottish Labour into a radical force for change once again. That’s why I’m asking you to vote for me to be your young SEC representative. I hope I can count on your vote. When BBC News broke the story that Kezia Dugdale had resigned the leadership of Scottish Labour on Tuesday night, I was shocked, and saddened. Perhaps no leader in the history of Scottish Labour has been so brave, so determined, or faced so vast a challenge. When Kezia took on the leadership Scottish Labour had just lost 40 seats in the most devastating general election in our history. To be brave enough to step up and take on what so many saw as a ‘poisoned chalice’ is laudable; to do so at the age of 33 even more so. Kezia began the rebuilding process that is vital to Scottish Labour’s political survival. Under her leadership, Scottish Conference voted to back the abolition of the Trident nuclear missile system, an important step in renewing Labour’s centre-left credentials in Scotland. Under her leadership, the SNP’s feet were held to the fire, and the Scottish Government’s left-wing mask has crumbled under the pressure of a renewed, vocal and determined opposition. And under her leadership, Scottish Labour began the essential task of rebuilding our parliamentary cohort, with 6 new MPs elected in the June 2017 general election. This rebuilding process is far from complete. But I believe Kezia was right when she said it was time to “pass the baton on” to a fresh new leader. For all Kezia has done much to detoxify the Labour brand in Scotland, that has come at a cost. The constant pressure of media scrutiny and public backlash against Scottish Labour’s past failings has naturally, though through no fault of her own, tarnished Kezia’s personal brand. In the eyes of many, she is undeniably linked to the hated New Labour political class, and this perception is only reinforced by her closeness to Murphy’s leadership, and her longstanding opposition to Corbyn’s leadership of the UK party. Kezia’s personal convictions have been a real strength of her leadership, giving her an authenticity that is rarely seen in politics and that Nicola Sturgeon simply cannot match. But it is these very same convictions that has made her position increasingly difficult. Scotland is, on the whole, a progressive country with a strong socialist tradition. For all people point to the recent Conservative revival in Scotland, it is important to note: over 70% of Scots voted for parties broadly on the left in the 2017 general election. But many among that 70% cannot see Kezia as a true socialist worthy of their vote. The truth of that perception is doubtful. Kezia has moved Scottish Labour firmly leftward in her time as leader, as was clearly demonstrated through the manifesto on which we fought the 2016 Holyrood election. But like it or not, in politics, perceptions matter. And the perception of many is that Kezia Dugdale is not the sort of socialist people want to see leading Scotland. Scottish Labour is a party founded on the principles of democratic socialism and that ideology has been central to our success in the past and to what we stand for even to this day. Indeed, it is when those principles of democratic socialism fade, as they did during the later years of Blair as Labour became too accustomed to the excesses of government both in Westminster and Holyrood, that Scottish Labour struggles. Huge droves of voters have abandoned Scottish Labour, many in large part due to the perception, wrongly or otherwise, that we have lost touch with our socialist roots. It is no coincidence that our worst ever general election defeat came under the leadership of Jim Murphy, a man who to many embodied the worst of neoliberal New Labour. For all the scepticism, Jeremy Corbyn’s new Labour vision has drawn hundreds of thousands, even millions, back into the Labour fold. For all the scepticism, Jeremy Corbyn’s leadership transformed an election that many believed could spell the final end for Scottish Labour’s representation in Westminster into an unexpected success. This surely must demonstrate the importance of a perceptibly bold left-wing platform to Labour’s political success. We are at our best when we are at our boldest. We are at our best when we offer a clear, progressive, and socialist message and can convey the boldness of that message to the public. Kezia has put the building blocks of that message in place but it has become apparent she is not the person to deliver that message to the Scottish public. We need a leader firmly of the left, who is, importantly, visibly of the left. In the highly-scrutinised world of modern politics, appearances are often as important as policy, and for that reason it is vital that whoever next leads the Scottish Labour Party not only be politically aligned with Jeremy Corbyn’s boldly socialist new Labour, but visibly and vocally aligned with his leadership. Despite the cries of the critics to the contrary, Corbyn’s bold left-wing vision has proven highly effective. One can only wonder what the future might hold were Scottish Labour to fully embrace that vision. Since 2014, indeed since 2011 when it became apparent that the SNP had enough seats in the Scottish Parliament to call an independence referendum, one question has dominated Scottish politics: the constitution. That question, intended to be settled on the 18th of September 2014, has continued to dominate Scottish politics for half a decade and it is a question that shows no sign of abating soon. Scottish politics has split into two camps, unionist and nationalist, each united by their animosity towards the other, and this polarisation has had devastating effects on our politics as a whole. No debate, no discussion, no policy proposal is complete without a mention of the constitution, and this constitutional focus has led the real issues which effect the ordinary people of Scotland to be ignored. The result? A failing education system, an NHS in crisis, disastrous cuts to essential public services. We say we are all agreed we want Scotland to be a better, more prosperous place, but our actions simply don’t back that up. For all the SNP’s protests, the Scottish Parliament does have powers to make a difference, powers that they are refusing to utilise. But the SNP cannot be held solely to blame for the dire situation in which Scottish politics finds itself. For all their protestations about the SNP being concerned only with independence, the Conservatives and Labour have themselves enabled the question of the constitution to define Scottish politics in one way or another. The constitutional question is important, clearly, but it is far from the be all and end all. The unyielding focus on constitutional politics has led to every vote in Scotland since 2014 being a rerun of the independence referendum. The people of Scotland have largely stopped paying attention to the policies of the party they are voting for, only what their stance is on independence. That is no way to build a modern functioning democracy. This must change. The importance of this is demonstrated nowhere more clearly than in the upcoming local council elections. Years of austerity have pushed local authority budgets to breaking point, and essential local services are increasingly under threat. The most important consideration when voting on 4th May must surely be which candidate, which party, will offer the best protection to these services which local people rely on. But there is a very real risk that that this vote will instead turn into yet another rerun of the independence referendum, with Scotland split between the nationalist SNP and the unionist Conservatives while those trying to offer real action to improve the lives of local people are squeezed out. There is a time and a place for the constitutional question to be debated and Scottish Labour would do well to keep in mind that there is a strong case to be made that the situation the UK finds itself in has indeed changed dramatically from 2014. But local council elections are absolutely the wrong place for that argument to be discussed. Local councillors have no powers over the constitution but they do have powers over vital services local people rely on every day, services the SNP and the Conservatives have little interest in running effectively. If people vote on the basis of the constitutional question, the results could be disastrous. But if instead people decide to vote based on the issues which really matter, it could be the start of a real positive change to Scottish politics. It’s time we as a country stop putting the constitution at the heart of every political debate. For too long, our politics has been held in stasis by that question, and the real issues have been left at the wayside. The constitutional question is not going away any time soon – that by now should be clear – but at the same time we cannot allow it to override every debate, discussion and policy proposal. It’s time to redefine the debate, and get back to discussing the real, relevant issues. There is a time and a place to discuss the constitution. But that is not where we could be making real change instead.